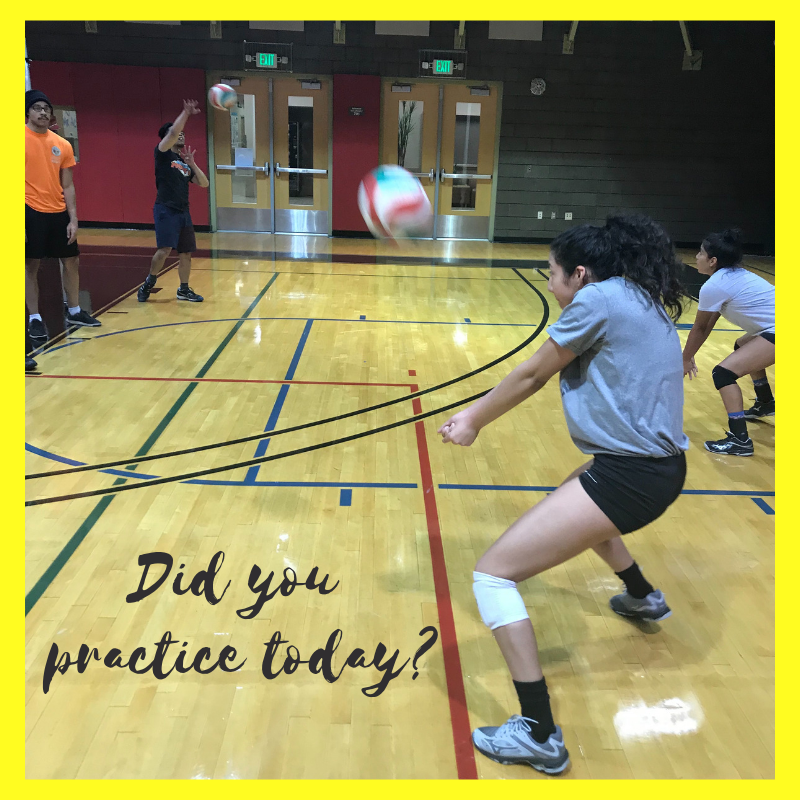 Learn the serving, hitting, passing, spiking, setting, blocking and practice volleyball drills we do in Boot Camp classes and drills for you to do so you can improve at home. Hitting volleyball drills and drills for setting, passing, blocking and serving are what you need to do on your own regularly to improve your game skills. I often tell players that performing volleyball drills at home and outside of the regular club and high school practice is one of the best ways to improve your skills. As a high school player, once I finished my school work and after coming home from practice, I would go outside by myself and do hundreds of setting and passing repetitions against a wall to a target I had chalked off against the garage door. I was disciplined about doing this every day in order to improve my accuracy, to improve my ball control, to increase my finger strength, to numb the throbbing sensation created by the ball contacting the same spot on my forearms over and over again when passing the ball to the target. Basically to improve my basic skills. I got to the point that when the ball bounced back from anywhere off the garage door I knew how to quickly use my feet to position myself in a low athletic stance with my hips below the level of the ball and then deliver a nice high pass from anywhere back to that chalked out circled target. Those self-imposed volleyball drills and the discipline to do them everyday paid off. I had set a goal for myself as a sophomore in high school that I wanted to earn a volleyball scholarship to a four-year college or university and I was going to do what it took to reach my goal. If you are one of those players looking for ways to help yourself get more playing time, make your varsity team or just improve your volleyball game then I suggest to you, to follow the same plan..because it works! Whether you do drills at home by yourself, or doing them in practice with your teammates, it's best to get in the habit of setting mini goals for yourself to reach in order to complete each drill. It's best to get in the habit of setting mini goals for yourself to reach in order to complete each drill. For example, let's say you have to get 50 perfectly passed balls to the target before stopping one drill and going on to the next. 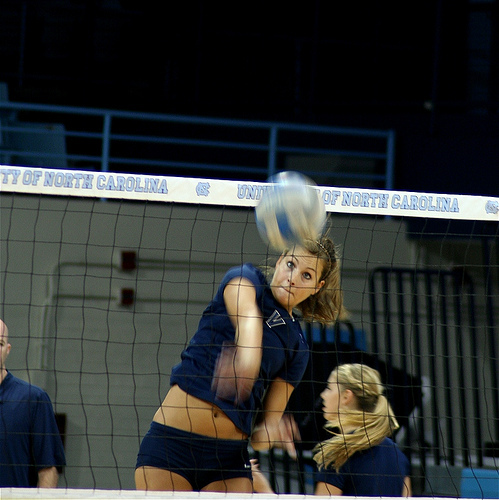 Not only will you discipline yourself to perform the volleyball drills correctly, but you will replicate the pressure you will feel in a game-like situation when you absolutely have to do the skill right. When you get in the habit of practicing game-like situations, then when you find yourself in an actual game, you have already prepared for that particularly tense and pressure-filled situation. In your practices, you may have noticed that different components of skills are taken apart and learned in progressions or separately one at a time. Many beginner volleyball drills are broken down into their most basic steps and as you learn those, then you progress to more advanced elements of the skill. So things like footwork, lower body positioning then upper body positioning, armswing mechanics and timing are learned and coached first. Other things are gradually added to the mix as you improve on the basics, like court awareness and positioning, court spacing among other teammates, foot speed, using wide vision and learning how to get to a volleyball quickly along with communication-what to say and how to say it. Drills can be taught as individual drills that players can learn and practice by themselves just about anywhere...at home, at club..in a gym on your own or at high school or college practice. Another way you are taught the game is with team drills which must be performed with three, four, five or all six members of your team. If you came to this page because you were looking for drills then you've found the right place. In this section I talk about the drills we do in our boot camp classes and drills you can do by yourself home when you aren't with us.